Another Friday night and I’ve got another fish dish! Tonight is a fun night because it’s one of the last thunder storms of the year. I love to see lightning and rain; there is just something so clean and exciting about it. I recently read that kids like sun and snow, but not rain; rain gets a bad wrap. The key is just knowing how to dress for it, if you can stay dry you’re going to be a lot more comfortable. I’ve been having a craving for pea risotto lately and with the rain I felt like making something slightly comforting to go with the healthy fish. Risotto can sound daunting to many people, but I think the key here is keeping the risotto moist, but not drowning it. Just like knowing how to handle the rain, risotto is just knowing how to work with it. Keep the liquid you’re adding to the risotto warm. Let the risotto slowly soak up the liquid. Stir often and have patience. You will have a beautifully creamy risotto that is worth it. Start by warming about 4 cups of water or broth (using broth will give just a little more flavor.) To the broth, add black pepper and garlic powder. ½ onion, I used red onion but you can use yellow. Chop these pretty small. ½ cup chopped (small) celery. Add 1 cup risotto; let that simmer in the pan with the butter and olive oil for a few minutes. Now you’re going to add the broth, just a scoopful at a time. So start with one cup and stir (you should on a medium low heat, you don’t want to force this to cook fast). Let that liquid cook into the risotto b efore adding another scoop of broth, about ½ cup or so at a time, but only when the first liquid is gone- stir often. When your risotto starts to expand slightly and take shape (if you taste it, it will be half crunchy still), then you can add your peas. You don’t really need to cook the peas, they just need to warm. Add 1 cup of peas. If you’re using frozen peas, just thaw them first. You’re going to start the fish when your risotto is about five minutes out from being ready. Until you make the risotto a few times, it’s easiest to test this by tasting. 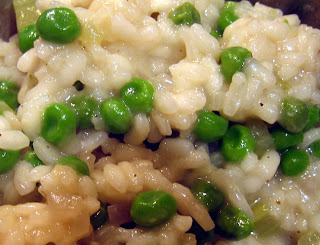 You want your risotto to be firm, not mushy, when complete. Place a little olive oil in a pan and add fish, season fish with lemon pepper and salt, cover and cook over a low to medium heat. I also like to add a couple of slices of lime to the pan for the extra citrusy flavor. These should only take about 5 minutes – cook just till the fish is opaque and flaky. Turn off your risotto and add ½ cup of shredded parmesan cheese, this will give it just a little more creaminess. Let that sit and melt in for minute. 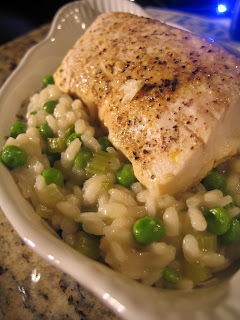 Then plate your risotto and top with the Mahi Mahi. Turn off the lights and light some candles, sit back and watch the lightning show. Enjoy your creamy risotto an quietly be fat and happ.